Ty Gurney Surf School is one of the only surf schools that offers video and photo services with our lessons and surf tours. We work exclusively with 83 East, a full-service video production company specializing in shooting from the water and delivering top quality, professionally edited footage. 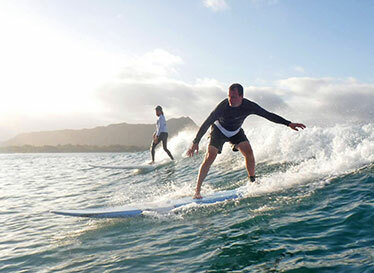 83 East offers a number of video and photo options to complement your surf lesson. To order or inquire about video/photos, please use our Video & Photos Contact Form below. 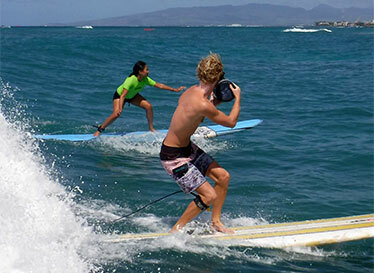 The most popular option and the one we recommend to everyone looking for the complete surf lesson experience. This all-inclusive package combines video and photos so that you take home maximum proof of your surfing skills! It’s a personalized, one-of-a-kind way to remember and re-live the fun of surfing in Hawaii, and a great way to help your progression and development by watching yourself surf. Our 83 East videographer paddles out with you to the lineup, films your surf session, and edits your footage into a personalized video, complete with bonus footage and a custom soundtrack. Photos are still frames taken directly from your video footage. The number of photos will depend on the length and number of your surf lessons. In general, a 1-hour surf lesson will generate at least 40 photos. When purchasing photos only, 83 East will email you a private link to easily and securely download your photos. Are video and/or photos included with my lesson? Video and/or photos are 100% optional and are not included with the price of lessons; there is absolutely no obligation to make a video or photo purchase. Video and photos are only included with the Romantic Sunset Surf Package. What do video and/or photos cost? How do I pay? Once you receive your quote and confirm your order, 83 East will send you a PayPal invoice and instructions to pay quickly and securely online. How do I sign up for video and/or photos? Didn’t sign up in advance? No problem. You may also order video/photos after your lesson by contacting 83 East. We’ll take down your information, confirm your order and arrange for payment, and get to work editing! Can you shoot surf safari island tours too? Yes! 83 East can shoot half and full day surf tours. Please note that video/photos for surf tours MUST be ordered at the time of booking. An 83 East videographer will only accompany your surf tour if you have confirmed and purchased video/photos in advance. I didn't sign up after my lesson. Can I still get video/photos? Yes! 83 East saves footage for up to 4 months, so if you surfed and were filmed within this time frame, you can still order video and/or photos. To do so, please use the Video & Photos Contact Form below. How long does it take to get my video and/or photos? Editing normally takes 1 to 3 weeks from the date your video/photo order is confirmed and paid to the date your video/photos are sent. Videos/photos are delivered via safe, secure download link emailed directly to you. Kindly allow for extra editing time during peak seasons (summer and holidays). Please use this form to order (or send us questions about) video and/or photos. Your message will go directly to 83 East. You may also email 83 East at 83east@gmail.com. Please be as descriptive as possible; this helps 83 East locate your surfing footage and respond to your inquiry in the fastest possible time. Mahalo! * If your question is not about video or photos, please click here to use the Ty Gurney Surf School Contact Form. If your question is not about video or photos, please click here to use the Ty Gurney Surf School Contact Form. Copyright © 2019 Ty Gurney Surf School. All Rights Reserved.